Our youngest grandson asked me if we could go fishing when Nana got out of the hospital. I told him we would go fishing very soon, but had to get Nana well enough for us to leave her for a few hours, which he understood. I remember going fishing with my dad when I was a child. We would drive from Greenville to Lake Greenwood and park our ’57 Ford Fairlane near the pier and tackle shop. Dad would always rent the children a cane pole for fifty cents and we would all fish overnight. I can still hear the crickets, tree frogs, katydids and bull frogs. And I remember the mosquito bites. Mother would fish too, but some nights she would get sleepy and she and I would curl up in the car for a nap. My brother Jerry would always catch more fish than I because he didn’t take a nap time. Vienna sausages and potted meat on crackers was the night’s menu. Potted meat smeared on crackers is especially good if you have a little earthworm residue left on your fingers. I have a memory of when dad brought home a large catch of catfish. Mother taught me how to nail the head to a plank, cut the skin and then pull it off with pliers. Hope you are not queasy yet, because the description of gutting comes next…Quite an experience if you have never done it. Oh well…I can still smell the smell…It never leaves your nose. 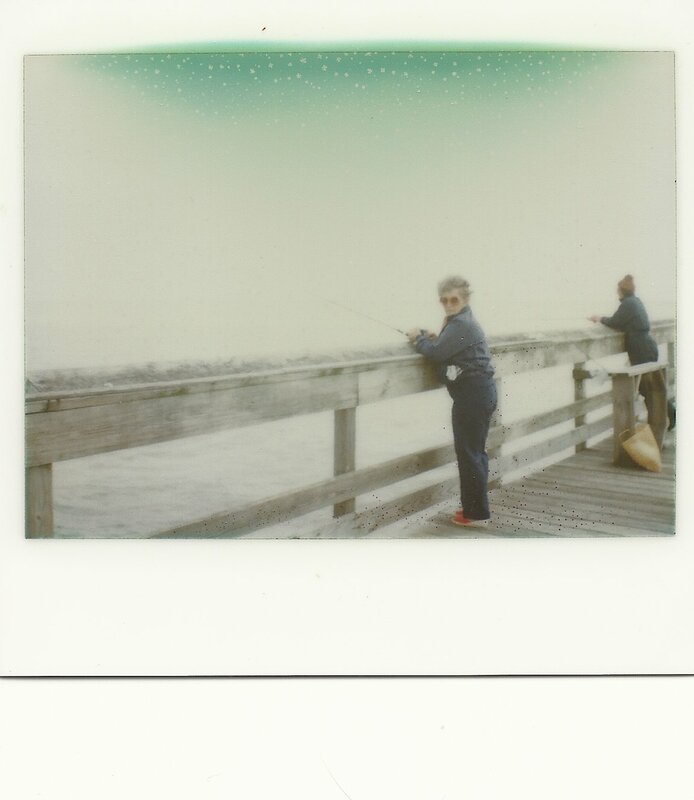 As Anthony was growing up, we took him fishing in the neighborhood pond, and Joy’s mom, Memon, later helped him learn the exciting surprises of pier fishing at the beach. One day in about 1980 at Lake Greenwood, Memon and Anthony fished off the bank while Joy and I swam. Anthony was young enough and did not need a license. Memon was over 60 and did not need one. When we finished swimming, Joy and I walked up to help Anthony untangle his line. While I was holding the rod for just a minute or two, a little green boat puttered up with two game wardens on board and they asked me to flash my fishing license to them. The next day I paid my fine and learned no lesson from it. Some things in life are just not fair, but funny years later. “Peter. John, and James in a sailboat out on the deep blue sea”….Sing it with me now.